Coral as we know it are a symbiotic relationship between the coral animal and dinoflagellates called zooxanthellae. Zooxanthellae live in the tissue of the coral and are like algae in that they contain chlorophyll for photosynthesis. The byproducts of photosynthesis are things like simple sugars that the coral hosts can use as an energy source. It is for this reason that coral are often described to the layperson as having traits of both plants and animals. The color of zooxanthellae is varying degrees of brown; however, there are over 80 known varieties of zooxanthellae. Depending on which types live in the coral, it can give coral a different appearance. Corals occasionally expel zooxanthellae to control both the amount of dinoflagellates and the varieties residing in the tissue. This is easiest to notice in LPS, where one might see brown stringy material getting spit out. This is usually done to adjust for some change in the environment or a stress reaction. The unfortunate bleaching of natural coral reefs is the result of corals expelling their zooxanthellae as a last resort to survive their changing environment. The color of light is important, not only for aesthetics, but also for the photosynthetic process. Chlorophyll in zooxanthellae does not absorb light uniformly. There are certain spectra of light that are absorbed highly, and other spectra that are rejected. The type of chlorophyll most commonly found in corals is Chlorophyll A, which has two major absorption peaks: one at the 440nm wavelength, which is a violet light, and the other at the 675nm wavelength, which is a red light. Light spectra neighboring those spectral peaks are also absorbed by Chlorophyll A, but also by different compounds (such as Chlorophyll C and carotenoids), so it is important for whichever lighting you choose that you have a robust spectrum outside of just the 675nm and 440nm spectral peaks. The color of light is measured by a Kelvin rating. If you recall from high school physics and chemistry, Kelvin is basically Celsius but starts at absolute zero rather than the freezing point of water. So, zero degrees Kelvin is equivalent to -273.15 degrees Celsius. Once you start turning up the temperature, this theoretical black body starts to emit light. The best way to visualize this is to imagine a star. Our sun burns at just under 6,000K, and we get that yellow light as a result. Once you get to about 8,000K to 10,000K, the black body radiates white light. Between 15,000K to 25,000K, the radiation appears blue. Just to clarify, the bulbs in your tank that are 10,000K are not burning at that temperature; they are just a similar color to a star that is actually burning that hot. A common misconception about higher Kelvin light bulbs is that they don’t necessarily have more blue than lower Kelvin bulbs that appear more yellow. The blue light in these bulbs is achieved by reducing the red, green, and yellow phosphors. It’s entirely possible for a 6,500K yellow-looking bulb to have a great deal more blue spectrum available for photosynthesis than a 20,000K bulb. Still, there are perks to using higher Kelvin bulbs. Bluer light is aesthetically pleasing but has the side perk of algae control, as algae tends to rely more on the reds, yellows, and greens (as compared to coral). Having said that, lower Kelvin bulbs grow coral faster. Possibly the best bulb I have ever seen at growing corals was the 6500K Iwasaki, although it was arguably the least attractive color (unless you are looking for a very yellow-looking shallow water reef). When I started reef-keeping, the rule was to get the brightest lighting possible. End of story. The most I have ever had on a tank was two 400W metal halides and four 110W VHO fluorescents over a 75-gallon tank. Needless to say, it was bright and warm. Fast-forward 20-something years, and I have some corals in extremely dimly-lit tanks doing just fine. In the bright tank example, the intensity was probably close to 1200 PAR, if not more. In my low light setup, the PAR was about 50. In both cases, coral grew just fine. In fact, with the exception of Acropora, the vast majority of the corals we keep here do quite well in low light. What seems to be more important than raw intensity is consistency. LED lighting over coral frags. I get asked fairly often which light is the best light. Unfortunately, there is no right answer. First of all, there is the difference in aesthetics, which is a purely subjective decision that only the hobbyist can make for himself or herself. Most of the time, hobbyists gravitate towards the blue end of the spectrum because it is very flattering to corals that fluoresce brightly. In terms of coral biology, what type of lighting will work the best for your tank will depend a great deal on what animals you intend to keep. As I mentioned before, corals will adapt to lighting by regulating their zooxanthellae, so most coral will grow under any of these lighting technologies. Having said that, it is also entirely possible to have some corals take on a desirable appearance while other corals become less attractive under the same light. Such is the price to be paid for a mixed reef tank. It is often not possible to optimize a light for every coral inhabitant when they come from completely different geographies and natural conditions. As far as the type of technology to use, it will depend on what aspects of the technology are most important to you. There are pros and cons to any type of lighting technology, whether it is LED, T5, metal halide, or even natural sunlight. Depending on your situation, the drawbacks of one technology might not matter to you; conversely, the benefits of another technology might not be meaningful to you. Let’s talk for a bit about each one in turn, starting with the most popular. LED fixtures are nice because they are offer the aquarist the most control. It is possible to control each LED individually, so the hobbyist can customize the schedule, colors, and intensity of the light. In my opinion, LEDs do the best job of showcasing corals by bringing out the most appealing fluorescence. They are energy efficient, and the LEDs themselves are long-lasting. Lastly, the fixtures tend to run cooler than T5 fluorescents or metal halides, which is a big deal for hobbyists in warmer climates, who have to battle to cool their tanks. It is far more difficult to cool water down than it is to heat it up. The downside to LEDs is that some corals do not color up as well under LED as they would under other types of light, in particular SPS and certain LPS, such as Acanthastrea and Micromussa. I use a lot of LEDs in my greenhouse currently, mainly to conserve energy, but I prefer both T5 and metal halide when it comes to growth and developing color. Some aquarists have issues with the spotlight nature of LEDs, where dark shadow areas on the underside of corals cause the colony to die off. Also, while the LEDs last a long time, the longevity of the fixture can be substantially shorter than the rated life of the LED, because other electronic components fail. The last downside to LED is not going to affect too many people, but for those interested in photography, LED is the worst light ever invented. For better or worse, LEDs are quickly becoming the most popular form of lighting in the hobby. LED is the newest technology and could see some major improvements down the line that eliminate many of the drawbacks I listed. T5 Fluorescent bulbs are thin glass tubes that produce a very robust light spectrum that colors up corals nicely. Almost every insanely-colored SPS aquarium that simply blew me away implemented this type of lighting. There are a lot of bulb choices available, so you can give your tank pretty much any type of aesthetic. I say “pretty much,” because the neon disco look that an all-blue LED light gives is pretty unique. While they are not controllable to the extent that LEDs are, there are some fixtures out there that can dim T5 bulbs to give that dawn/dusk lighting effect (though I don’t know if that reduces the life of the bulbs). Lastly, because the light emitted by a T5 bulb is spread out evenly over the length of the bulb, there is almost no trace of shadowing effects that plague point-source lighting. No lighting system is perfect however, and T5 fixtures have their drawbacks. First off, the bulb life is frustratingly short. They begin to erode, both in terms of spectrum and intensity, right around 6 months, and by 12 months they are a drastically different bulb. Here at the greenhouse, I run them a lot longer than that, just because they are supplementing the sunlight we receive; when I do finally get around to swapping out the bulbs, the difference is staggering. The second downside is the energy efficiency; while not horrible, on a per-bulb basis it is not as good as the LED lights. Depending on the number of bulbs in the fixture, it can get expensive to operate. For example, if you have an 8-bulb fixture, the electrical consumption, along with the cost of bulb replacements, might make for the most expensive lighting upkeep out of all the technologies. Lastly, the bulbs themselves are fragile and can easily break during shipping, especially when you consider the longer bulb lengths of 48” and 60”. Finally, we get to metal halide, which I would venture to guess is the least popular form of lighting at the hobbyist level and likely the most popular lighting at the commercial level. The positive aspects of metal halide are its intensity, spectrum, and longevity. When it comes to growing light-loving corals, I don’t think any other technology does it as well. Metal halide bulbs are a point-source light like LEDs, but are even more concentrated. When shining down into the tank, they create a very pleasing shimmering effect which is almost absent under the diffuse light of a T5 fluorescent bulb. Those shimmer lines closely replicate what is seen in nature, and there was a study done several years back that indicated that corals actually benefited from them. The major problems with metal halide are energy consumption and heat. Metal halide bulbs consume a ton of electricity, and a newly-installed halide fixture will be noticeable on your monthly electric bill. The heat generated by metal halides is also something that has to be dealt with. In large aquariums situated in a large room, some well-placed cooling fans might do the trick. On smaller aquariums or in tight quarters where heat builds up, one might need to install a chiller or crank up the air conditioning to compensate. Either way, heat management will further increase the electricity bill. In terms of controllability, it is practically absent from these bulbs. They can turn on and off. In some ways, they don’t even do that well all the time, because some require a cooling-off period before being able to turn back on. There are dimmable metal halides, but from everything I’ve read, it’s not great for the bulbs, and some bulbs will shift colors as a result. Now that we have gone over the types of lighting, hopefully you can see that all of them have their pros and cons. What will make for the best light in your tank will depend in large part on the factors that are important to you. 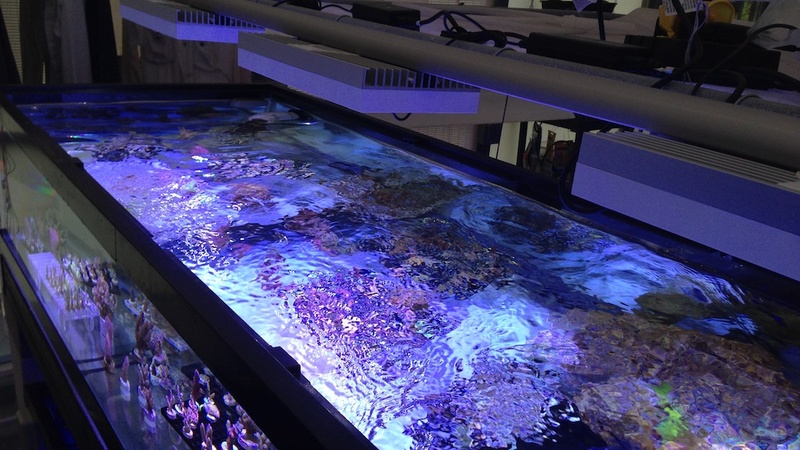 I can say up front that most corals can be kept under just about any kind of light fixture. The list of corals that demand extremely intense light is surprisingly short, but who am I kidding, we aquarists are always trying to squeeze out that last 1% of color from our corals. Picking a light can be daunting, but the obvious solution to deciding on a fixture is to not really decide on anything. You could get a light that incorporates more than one technology. Hybrid lighting systems exist: they combine either LED and T5, metal halide and T5, or metal halide and LED. There might even be some systems out there that are a combination of all three. That fixture might be shockingly expensive, so here is a cost-saving tip. Let’s say you have some LED fixture you are happy with but want to supplement it with T5, but you don’t like the look of the T5 bulbs. What you could do is purchase an inexpensive T5 fixture with all white bulbs and only run it for about 4-6 hours while you are away from the tank. That way, the corals still benefit from the light and color up nicely, but the light doesn’t interfere with the aesthetic of the LEDs when you return home. Tidal Gardens uses a mix of natural light from a greenhouse structure and supplemental light from mainly T5 and LED fixtures. The idea when the greenhouse was constructed back in 2002 was that the sun is the perfect light on the perfect timer, and corals grown under this light would be the healthiest specimens for lowest electrical cost. This premise still might be true, but not necessarily in Ohio, where the greenhouse is located. The difference in lighting from season to season has a drastic effect on the corals, and some species don’t like it at all. One might guess that it is the cold, dark Ohio winters that are the problem, but it is actually the summers. The winter months, it turns out, are some of the best for growing coral. I think it has to do with both the change in light intensity and the photo period. In the summer, it feels like the sun is in the sky twice as long, and that’s not a good thing. The shorter photoperiod of the winter months has proven to be a much better situation for the corals here. Setups that are designed to use natural light would be the most successful in areas that have the most consistent climates, but preferably not in crazy-hot climates, because, as I mentioned previously, it is far more difficult to chill water than it is to heat it up. Light is a vitally important aspect of the hobby, and is a heavily debated topic among reef aquarists. Hopefully this article helps you decide which type of lighting you want for your system. Let us know which one you end up choosing.